This was a unique pen restoration and I am not certain that I followed the correct procedures, but it works and is worthy of discussion. I like Gold Bond pens. 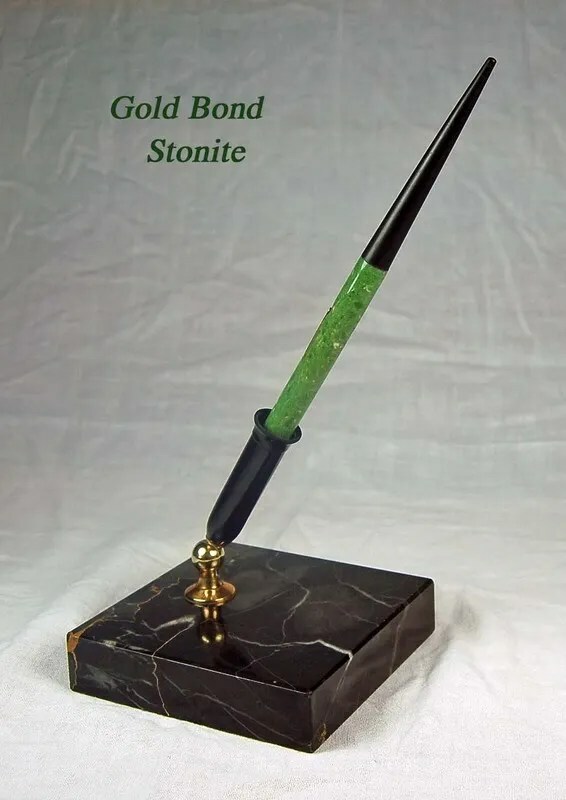 I have a few Gold Bond Stonite pens and they are very well made, solid, and are good writers. So, I jumped at the chance to purchase this one. What I found on the inside was a mystery to me. As you can see in the first picture below (of the pen after taking it apart) the section is a screw fit. This means that it screws in to the barrel. While this is not unique, what is unique is that there is no place to attach a sac to the section. Also, on the inside of the barrel there is a collar. The pen was easy to clean up and all of the parts were salvageable, except for the sac, which was dust, and provided no clues as to where it was attached. My first thought was that the section had an additional part to it, extending into the barrel. But it was not there and this did not explain the collar inside the barrel. I decided to put the pen down, think about it for a while, and I went to my Moleskine notebook to draw it out. The idea I came up with is shown below. I will apologize here for the poor artwork (especially the head scratching). What I decided to try was to attach a narrow (size 14 1/2 – usually used in Snorkels)sac to the collar. 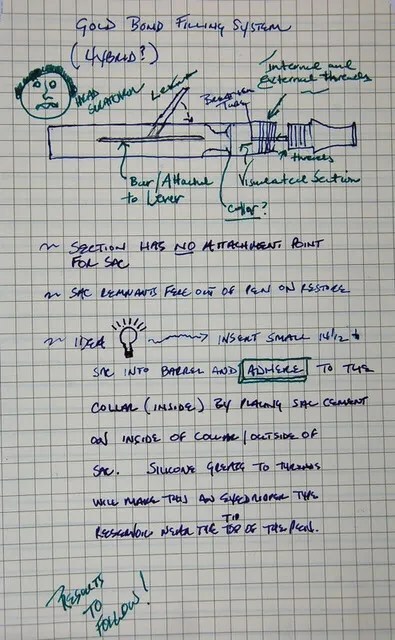 In doing so, I was creating a filling system that has two chambers: the sac / lever chamber and the chamber between the collar and the section/feed/nib. This is essentially an eyedropper section. The section is a clear (visualated) one, so the ink level will be entirely visible. The only areas for leakage would be the lever opening which will be protected by the sac, and the section, is a screw fit and can be sealed by silicone grease. I was not sure this was the correct solution, but was willing to give it a try. I cleaned all of the parts above, put the nib/feed/ section back together and inserted the sac to the collar, by carefully coating the collar and outside of the sac with sac cement. I let this dry for a day, before continuing, as it seem to me to be the weakest point in my plan. I tested this adherence by pushing the lever several times and checking my cement point. It seems to have held. I then coated the threads of the section with silicone grease to give a water tight seal and screwed it into the barrel. The finished pen is shown below. Now to try it out with water. I put the tip in a glass of water and moved the lever to deflate the sac. Water was sucked up into the pen. I let it sit for a day and then pushed the lever and water came back out of the nib. I then unscrewed the section and checked my sac, which was still solid against the collar. So, I have a working pen. I am still not sure if this is the way this pen was designed, if I am missing some original parts, or if my head scratching clouded my vision. But, I have a nice looking Gold Bond pen ready to write. Gold Bond pens were a Montgomery Ward Store brand – sold in Stores and through their catalogs. In my December 11, 2007 entry – Store Pens – I talked about another Montgomery Ward brand – Lakeside. Possible manufacturers / parts providers are speculated to be National Pen Products (Chicago) / C. E. Barrett. Here is a close-up of the nib. As you can see, the iridium tip is still intact. As with all of my restorations, comments and questions are welcome. I would love to know the correct restore on this one and if I am missing any original parts.